Jack Nicholson got a lot of attention for directing 1990's THE TWO JAKES (a watchable, though emotionally-flaccid CHINATOWN sequel), before the film went belly up financially. 12 years earlier, Jack had tried his hand behind the camera with GOIN' SOUTH, and didn't impress audiences either. 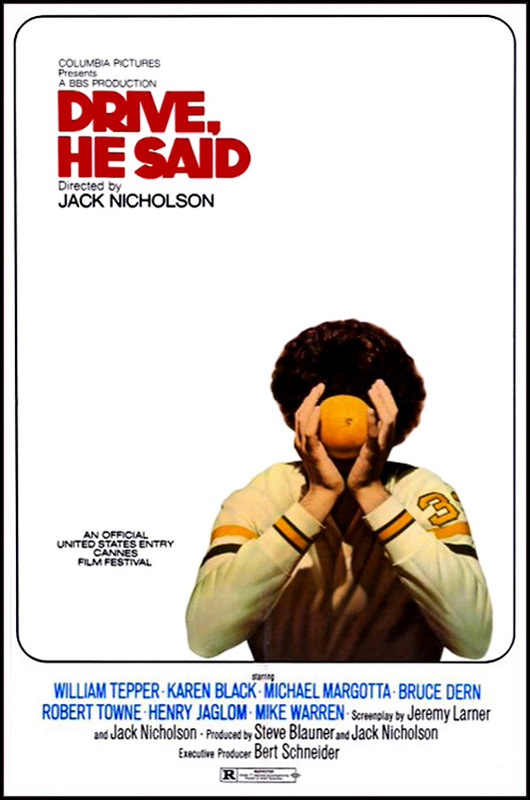 But let's return to Nicholson's directorial debut, which also didn't make Dime One, but not for the fact it isn't one hell of an impressive work. 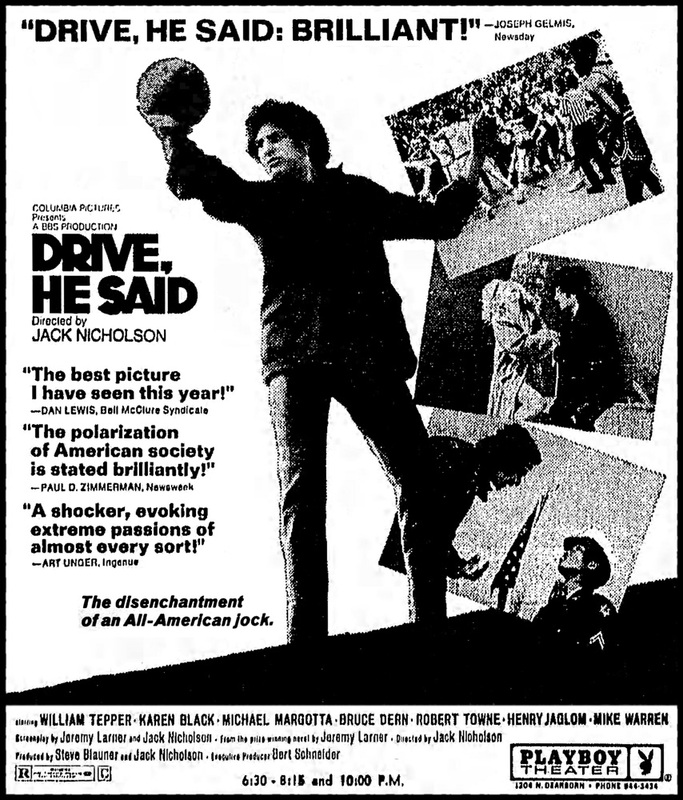 The notion of Jack directing (though not appearing in) a film about college rebellion in the early '70s brings to mind a combo of PSYCH-OUT and THE TRIP. Nope. Because it never goes for standard stereotypes, druggy kicks or easy answers. And Columbia Pictures must've been dumbstruck by this art-heavy item, when all they'd wanted was EASY RIDER, PART 2... The star of the film is William Tepper (Yeah, I know...Who?) playing Hector, an Ohio college basketball star who finds himself face-to-face with that era's emotional and social upheaval in the form of his possibly-crazy, long-haired roommate Gabriel (Michael Margotta), who's vying for the title of Resident Campus Revolutionary by staging guerilla theatre or dodging the draft by attempting to puke in the psychiatrist's face. Also on hand is Karen Black as a prof's wife, who having an affair with Tepper (Karen actually gets to act, instead of just showing off her bad perms). And Bruce Dern is brilliant in a very different role for those of us who admire him for THE WILD ANGELS, THE INCREDIBLE TWO-HEADED TRANSPLANT, or shooting The Duke in the back in THE COWBOYS -- as the hard-assed basketball coach. 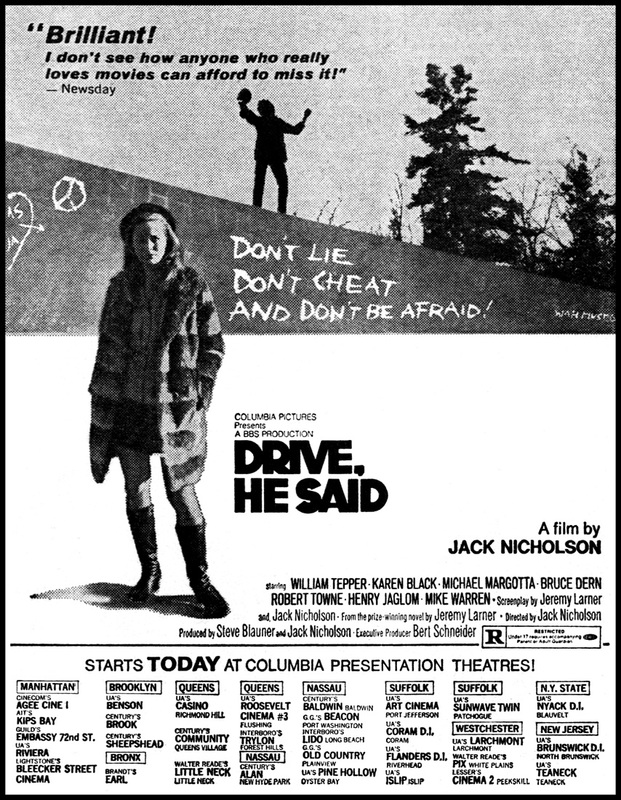 Not to mention filmmakers-to-be Robert Towne and Henry Jaglom, who turn up in front of the camera as college professors...The script goes off into several different directions, giving us a slice of life without resorting to the heavy-handed preaching that weighed down other campus revolution-fests like THE STRAWBERRY STATEMENT and GETTING STRAIGHT, as we observe Tepper's evolution of rebellion. From antagonism with Dern on the court and deteriorating emotional relationships, to a simple awareness of the growing cultural malaise. Nicholson also uses the events to illustrate America's need to win, the loss of freedom, and an overwhelming sense of chaos. Sounds high fallutin', you say? Sorta, and the dialogue sometimes lapses into pretentiousness. It would also help if one of the leads was truly sympathetic, but both Tepper and Margotta are charisma-barren... Looser and freer than his later directorial work, Nicholson meshes visual bravado with an ultra-realistic edge. 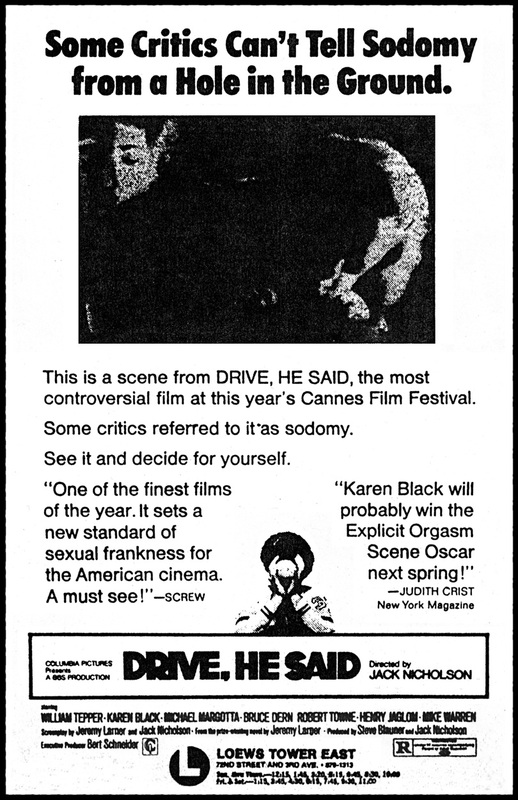 Sometimes boring, sometimes riveting, the film captures both the idealism and naivete of the period. As well as being one of the few sports-oriented films that didn't make me want to kick in my picture tube out of sheer annoyance. Sure, the camera dwells on the beauty of the game (proving how big a B-ball fanatic Jack was, even back then), but it's all for a good cause. Often brilliant and thought-provoking, it's a solid piece of social cinema.